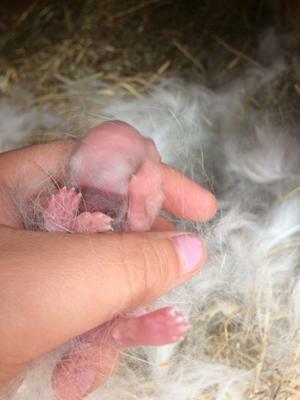 I am not a rabbit breeder but I seem to be in a streak of my buck Houdini has started a chain of pregnancies within my does since he came to me from my older sister; and because of this ever since we've had litters upon litters upon litters. I have a hutch just for my big girls we have had to segregate due to a buck whom we had castrated but managed to get two of my does pregnant. due to these births we have moved the older and bigger girls to another hutch. One of my does which thankfully we've managed to identify as the mother has recently given birth to a litter of three kits. But I've noticed that one of her kits has a red nose and mouth. 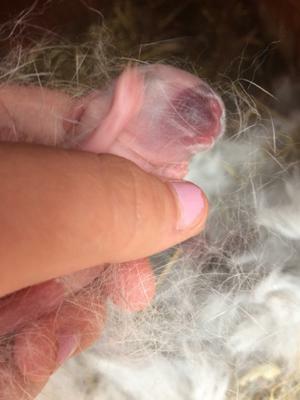 other litters I have had in the past and present have never had kits with this discolouration and was wondering if it could be an infection or some type of birth defect. Thanks for the photos. The redness looks to me very much like bruising during the birthing process. 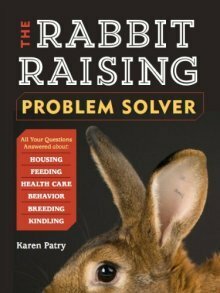 I'm not actually sure what kind of injury would cause that pattern of bruising, though if this were the first bunny to present, sometimes the doe has a bit more trouble with getting it out, and may be a little bit more rough with birthing the kit. Whenever necessary, always check with a veterinarian. If the redness is indeed bruising, then this should heal up just fine within the next week or two. You could try taking a peek through the fur that will soon cover the muzzle and see if any discoloration remains after, say, one week. I'm hoping all will end up well.